HealthAid HeartMax Omega-3 EPA/DHA combinesOmega-3 EPA / DHA with Garlic, Amino Acids, and powerful Antioxidants to help support normal heart health, circulation, and maintain healthy cholesterol levels. Contains omega 3, antioxidants, garlic, CoQ10, amino acids and bioavailable lycopene. Helps support and maintain heart health, circulation, and maintain cholesterol levels. Free from gluten, wheat, dairy, added sugar and salt, artificial colours, preservatives and flavourings. 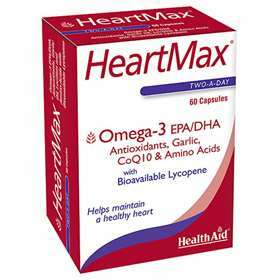 HealthAid HeartMax Omega-3 EPA/DHA is suitable for adults and children over the age of 16 years old. Take two capsules daily with food. Do not exceed recommended daily intake unless advised by a suitably qualified person. Fish Oil Concentrate, Gelling Shell agent (gelatine), Humectant (glycerol, purified water), Natural Colours (black iron oxide, red iron oxide), Bulking Agent coconut oil, soybean oil (soya), yellow beeswax, L-Carnitine Fumarate, L-Taurine, Emulsifier (lecithin), Alpha Lipoic Acid, Coenzyme Q10 (CoQ10), Grape Skin Extract, Citrus Bioflavanoids, Lycopene, Garlic Bulb Oil (allium sativum), Chromium Picolinate.